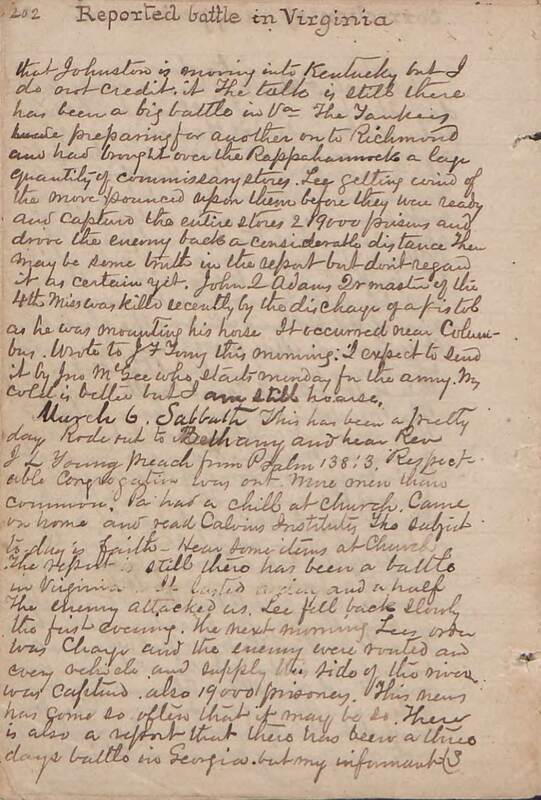 Item Description: Diary entry dated 5 March 1864. Samuel Agnew discusses the growing lawlessness, news of the war, supplies, a casualty, and an appraisement correction. Samuel Agnew was a Presbyterian minister in northern Mississippi born in 1833 whose journals detail the Civil War along with Reconstruction. Item Citation: Folder 9, Samuel A. Agnew Diary #00923, Southern Historical Collection, Wilson Library, University of North Carolina at Chapel Hill. This has been a very pretty day. This forenoon I lolled about reading some old numbers of Harper’s Magazine, and glancing at the Spectator in miniature. This evening Messrs. Jno. Haddon, J. O. Nelson and J. B. Gambrell met here to correct some discrepancies in the bill of appraisement of the personal property of Dr. Washington Agnew, dec’d, and also to revise the property given to the widow. The error is supposed to have originated in an omission of H. L. Holland, who was the clerk when it was made May 11, 1863. They discovered what was wrong and righted it. I don’t think that Aunt Sarah will be satisfied. The Memphis waggons have returned. They were not molested, but had to remain in Memphis 5 days to transact their business. Some of the waggoners passed this evening. They were from about Guntown. I have not heard any items of news which they bring. Only 50 lbs. of salt is allowed to be brought out to a family now. A Lt. Wallis & Mr. Bromley were arrested a day or two back for horse stealing. The horses were stolen below here. Lt. Wallis is the principal. They are sent below for punishment. An old man was murdered near Pleas Thomas’ by a Mr. Nelson and Thomas’ son for money. They pretended to think he was a spy. Lawless acts are growing common. It is rumored that Johnston is moving into Kentucky, but I do not credit it. The talk is still there has been a big battle in Va. The Yankees are preparing for another on to Richmond, and had brought over the Rappahannock a large quantity of commissary stores. Lee getting wind of the move pounced upon them before they were ready and captured the entire stores, & 9000 prisoners, and drove the enemy back a considerable distance. There may be some truth in the report, but don’t regard it as certain yet. John Q. Adams, Qr master of the 4th Miss. was killed recently by the discharge of a pistol as he was mounting his horse. It occurred near Columbus. Wrote to J. F. Young this morning. I expect to send it by Jno. McGee, who starts monday for the army. My cold is better but I am still hoarse. 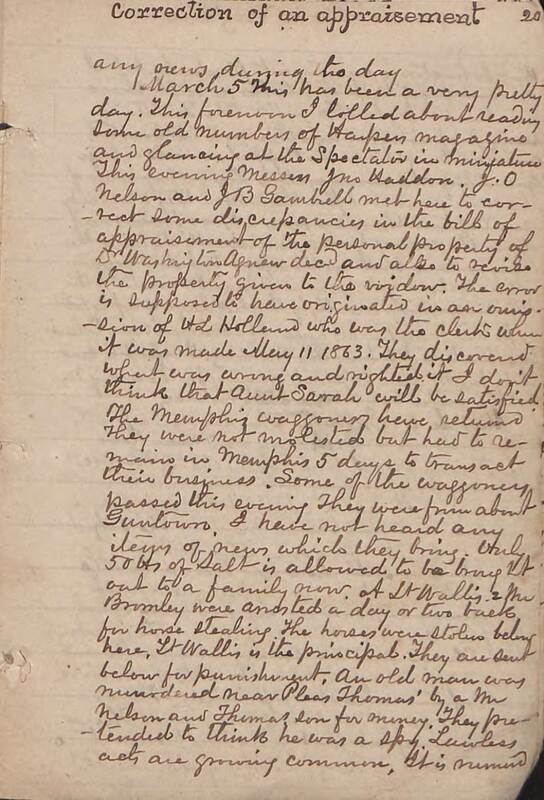 This entry was posted in Southern Historical Collection and tagged casualty, crimes, Gen. Johnston, salt. Bookmark the permalink.